Kala have a great reputation for producing an affordable, good-looking ukulele that shows off great quality for the price – and this KA-PWS Soprano is no exception. Coming in at under $200 this striking ukulele retains affordability, but is a step up from your more basic entry-level models. It’s very popular with experienced ukulelists as it is beginners – let’s find out why! This is one handsome instrument, and one that instantly announces that this ukulele is a slight step out of the entry-level market. Its beauty is primarily down to the use of a Pacific Walnut laminate on the body – a lightly-colored wood, peppered with dark grain. The clean, no-fuss body style, with a satin finish and refined black body binding, exudes a sense of quality – there’s something quite high-end about the design. The body itself is soprano sized, with a total length of just under 21”, and is comfortable to hold, especially for players with smaller hands. The mahogany neck joins the body at the 12th fret, as is traditional with a soprano, and features either a rosewood or walnut fretboard (depending on the marketplace). Out of the box it’s well setup, and playability is surprisingly great, with a low action and slick feel. For something that still comes in at under $150, this is a charming little instrument and receives high marks for its design and feel. While there’s nothing extraordinary about the hardware, the lovely body is complemented with some good quality components that ensure the KA-PWS remains easy to use and play. This includes a set of Grover open-geared tuners, with chrome-plated die-cast tuning keys that are pleasant to use – smooth action and hold the tuning well. There’s a rosewood/walnut bridge, with a GraphTech NuBone saddle and a matching nut, for added tonal consistency, while the uke comes strung with good-quality Aquila Nylgut strings. Audibly, this is a very good little uke, with a full tone. It offers a bright, articulate crispness that makes it particularly suitable for focused fingerpicking. Strumming is a little less clear, as the walnut is quite trebly, but this isn’t a big gripe. Finally, even with its small soprano body, the projection isn’t bad at all. It’s hard not to love the look of this affordable uke. For well under $200, you’re getting a design that wouldn’t be out of place on a high-end instrument. But this shouldn’t surprise you, as Kala are well known for their design and craftsmanship, even at the lower end of the market. Throw in some solid hardware and a sweet, bright tone, and this soprano uke offers seriously good value for beginners and experienced players alike. 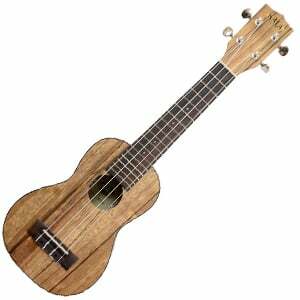 For more info about the Kala KA-PWS Soprano Ukulele, click here. For more Ukulele Under $200 you might like, click here.